Cuban-born cigar maker A.J. Fernandez is nothing if not prolific. In addition to making his own cigar lines, he has collaborated with numerous brands big and small including Rocky Patel, Foundation Cigar Company, Aging Room, La Palina, and Altadis (Montecristo, H. Upmann, Romeo y Julieta, and Gispert). Fernandez burst onto the scene with cigars made for catalog and online giant Cigars International, including Man O’War and Diesel. More recently, he’s been creating cigars for General Cigar, which is owned by the same parent company as Cigars International. In 2016, he made Time Flies under the Foundry brand and Hoyo La Amistad. At this year’s IPCPR Trade Show, General Cigar followed up Hoyo La Amistad with Hoyo La Amistad Silver. (The original features bands with gold trim while the Silver line has, as you’d expect, silver trim.) Both cigars sport an Ecuadorian Habano wrapper around Nicaraguan binder and filler tobaccos. The Silver has filler tobacco from Estelí and Condega (while the original uses tobacco from Condega, Estelí, Jalapa, and Ometepe). Made at Tabacalera Fernandez S.A. in Estelí, Nicaragua, Hoyo La Amistad Silver boasts delicious pre-light aromas with classic dark chocolate and rich earth wafting from the cigar as soon as it is removed from its cellophane. The dark, nearly oscuro wrapper surrounds a firmly constructed cigar that produces a sturdy light gray ash, even burn, and flawless draw. 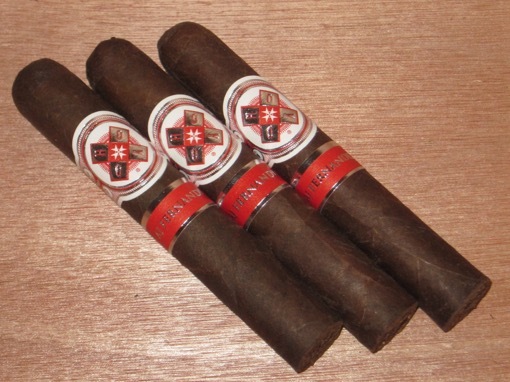 The three Robustos (5 x 50) I smoked for this review all had a flavor profile characterized by dry chocolate, oak, pepper, and black coffee. Flavors are medium- to full-bodied with minimal variation, except an occasional slight bitterness. More than once, I was reminded of San Cristobal made by My Father Cigars. That’s a high compliment, as it’s a cigar I enjoy quite a bit and is priced a bit higher than the Hoyo, which has a suggested retail price of $7-8 per cigar. All around, despite the infrequent bitterness, this is an excellent, well-made cigar that will appeal to fans of classic Nicaraguan flavors. That earns the Hoyo La Amistad Silver Robusto a rating of four stogies out of five. Am I missing something, or is the only difference between Hoyo La Amistad and Hoyo La Amistad Silver that Silver removes the Jalapa and Ometepe filler leaves? If that’s true, this is exceedingly rare, right? I mean, usually two related cigar lines have one major difference (i.e., different wrappers). Good observation. Here is some additional information that helps distinguish the 2 blends. Think about it from a bourbon perspective…emphasizing barley and corn vs. adding rye to the mash.